"I give up. This column was going to be a plea for LeBron James to apologize to Cleveland fans for the classless way he exited the city. An apology would relieve some of the stress on a Heat team totally uncomfortable with playing the role of villain, of being the team America loves to hate. ...But I give up. LeBron James looks, feels and sounds like a lost cause today, a millionaire celebrity incapable of reaching rock bottom, self-reflection or uttering an ounce of remorse. Talent in the kind of abundance James is blessed with is a curse. It seduces the owner into believing his flaws are his strengths. ...He can earn lifetime financial security without ever attending college or grinding at the bottom of the corporate ladder. He can win friends and be popular with women without ever demonstrating humility or showing respect." This is just a snippet of Jason Whitlock's article on LeBron James. The Miami Heat will make their first appearance in Cleveland tonight to face the Cavaliers. It will mark the return of LeBron James. The media coverage of this event beyond the sports world should be immense. An intense night for the fans of Cleveland is on tap for sure. Whitlock is the opinionated and controversial sports contributor for FOX Sports Radio and FoxSports.com. He was formerly with the Kansas City Star newspaper. 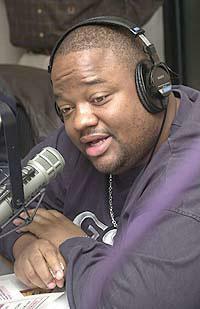 Is Jason Whitlock on point or just a hater of LeBron James?